I enjoy watching sports on television. Not binge-type watching, but a bit here and there. I enjoy baseball, football, a bit of basketball and soccer and, of course, as a good Montrealer my favourite is hockey. There is a very popular sport called football in most of the world, and soccer here in North America. It is also often referred to as the ‘Beautiful Game’, no doubt for its emphasis on simplicity and grace. While growing in playership here, it still lags in television viewership and that is after all what pays the bills. When I was a boy playing hockey the rule was that, with the exception of holding it, you could do pretty much what you wanted to an opponent’s stick. When it comes to baseball and football I am familiar with the rules of the game. When I watch basketball or soccer, my ignorance of the finer points of the game often has me confused about which player broke the rule when an infraction is signalled. Who was fouled by whom? But not so with hockey, our national pastime, a game I have watched all my life. Well, maybe that’s not true any more. Lately there have been times when I have thought there was a movement afoot, perhaps even a conspiracy, to make hockey soccer. Indeed on several occasions, even with the benefit of replays from various angles at various speeds, I am at a loss. It does not look to me that any penalty occurs on the play; yet sure enough a player is sent off the ice. Or the player I thought had transgressed is actually the victim. I believe this has to do with several ‘crackdowns’ the league imposed a few years ago. After a season was lost to negotiations the NHL took advantage to tighten up the way the rules were applied. … when the sounds of a forward streaking away with the puck included not only the slicing of the ice under his skates, but the smacking of a trailing opponent as he whacked the thigh pads of the player ahead with his stick. Let’s look at the holding penalty. I recall when a player had to actually hold an opponent to be assessed a holding penalty. Now if it looks like a player might hold another, if he ‘reaches in’, a penalty is called. Like horseshoes, close is now good enough. And frankly the degree of overt holding used to be taken into consideration; a little tug on a player’s jersey would warrant a shouted warning from the referee – ‘Let it go, Bobby’ – not a two minute penalty. When I was a boy playing hockey the rule was that, with the exception of holding it, you could do pretty much what you wanted to an opponent’s stick. Bang it, poke at it, slap it. If you had your stick knocked out of your hands, it was you who, upon returning to the bench, got a lecture from the coach about holding it tightly. God forbid your stick should break as a result of an opponent’s jab. Then the taunting – ‘Hey, when’s your father going to get a job and buy you a real stick? – was merciless. Now the NHL calls penalties against those who ‘slash’ another’s stick. Some recent rule changes have certainly made the game better. A team that ices the puck can no longer change players, and there is no commercial break after an icing. The idea of using the icing to put fresh legs on the ice, or catch your breath is no longer possible. This has improved the flow of the game. Also the new means of determining an icing call is much safer. 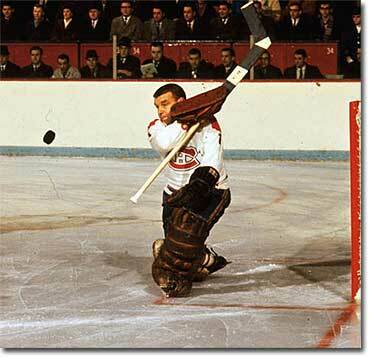 Gump Worsley clears the puck over the boards. Now a penalty. A player who shoots the puck over the glass, without it touching the glass, is given a penalty for delay of game. God rest his soul, somewhere Gump Worsley is rolling over in his grave. As is the case with most sports much attention is finally being paid to head injuries and their prevention. But other rule changes have affected the physical aspect of the game. A penalty called clipping, a very low check that endangers players knees, has reduced the number of good hard hip checks. There was a time, not so very long ago, when the sounds of a forward streaking away with the puck included not only the slicing of the ice under his skates, but the smacking of a trailing opponent as he whacked the thigh pads of the player ahead with his stick. These were not vicious slashes, but just reminders that the player was there. Now that is a penalty. Part of the conspiracy to make hockey soccer. It has even been suggested that the playing surface be enlarged to allow for more freedom of movement and, correspondingly less physical contact. Sadly yet another aspect of the conspiracy to make hockey soccer.